Both the »Arab Spring« and the strengthening of the Jihadist brigade »Islamic State« have brought diverse Islamist movements under the spotlight of the media and journalism. 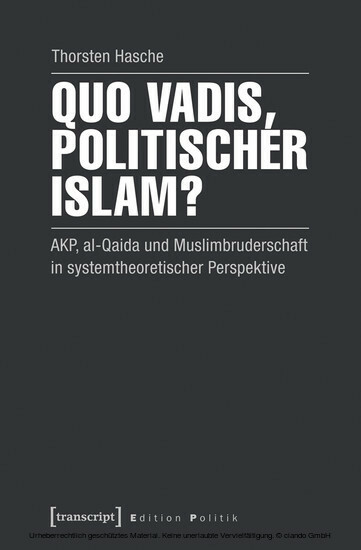 Based on Niklas Luhmann's social theory of politics, Thorsten Hasche investigates three central movements of Sunnite Islamism in the AKP, al-Qaida and the Muslim Brotherhood. Historically and comparatively, he considers their thought leaders, their political ideologies and their structures. It becomes clear that Sunnite political Islam will remain a powerful presence in global political systems, at least in the medium term. Thorsten Hasche, geb. 1981, lehrt und forscht als Politikwissenschaftler an der Universität Göttingen. Seine Arbeitsschwerpunkte liegen in den Bereichen der politikwissenschaftlichen Theoriebildung und der Transformationsprozesse der Region des Nahen Ostens und Nordafrikas sowie der besonderen Rolle islamistischer Bewegungen.